Between 1918 and 1938, we find at least four different women - Olga Picasso, Sara Murphy, Marie Therese Walter, and Dora Maar- associated with Picasso's shifting classical ideal. As each woman is assimlated to this ideal, her individual features are transformed and on some occasions, merged with her rivals. Similarly the characteristic costume of one woman may also be found in a portrait of another. By the summer of 1922 the Picasso and the Murphy families had become good friends. A series of notebook drawings, followed by a pastel, and then four paintings in the latter half of 1922, reveal the two women[Olga and Sara] had become linked in Picasso's mind. Both of them maternal figures, but Sara warm and relexed while Olga was tense and fastidious. In the definitive watercolor from the series, the mother resembles Sara more than Olga, and the same can be said for this painting. But can we assume that this is a portrait of Sara? Sara was certainly celebrated for her qualities as a mother. In contrast Olga largely lft Paulo in the hands of a governess. 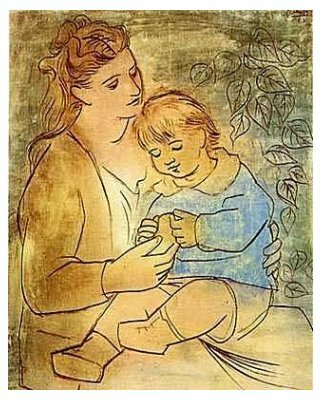 But it wouls seem more accurate to describe the mother in this painting as a kind of wish-fullfillment, subsuming echoes of both Olga and Sara into a classical apotheosis of the ideal mother/wife.